walkthrough type metal detectors are primarily designed for static use, and as with any high tech electronic equipment, there is obviously a risk of damage to internal electrical connections through continued assembly and disassembly. 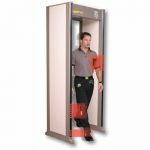 No self respecting manufacturer of Archway type walkthrough metal detector units would therefore claim their units to be ideal for frequent dismantling and reassembly at different locations. The G6500i unit has however been designed to enable its easy movement between locations, by the addition of a permanently fixed wheeled dolly foot. The wheeled dolly foot which fits to the base of the arch unit, takes about an hour to fit and allows the unit to be easily moved between locations in its assembled state. The fully assembled unit fits easily into the back of a short transit (or larger) van. - the unit is designed for 110v-230v mains power operation, however a battery backup facility is available to allow continued use in the event of a power failure, or where a mains power supply is not easily available. The optional battery fits inside one of the side panels of the unit and takes around 15 minutes to fit. Once fitted it remains in position and offers up to about 7 hour operation of the unit from fully charged. The battery is recharged by plugging the detector arch into a convenient mains supply, and the trickle charge process takes about 24 hours to fully recharge the battery. It is important therefore to consider the viability of mains power access and the recharging cycle when evaluating the use of battery powered operation. Installation - Installation is simple and straight forward. Using the simple installation guide / user manual supplied, customers find that it takes typically around 25-30 minutes to assemble and install the metal detector ready for operational use. The fully assembled weight of the unit (circa 64kg) means that for safety reasons and to avoid the possibility of accidental damage, parts of the installation process require two persons (i.e. lifting the unit into the vertical position following the simple on the ground assembly). In the unlikely event that you should require advice or help during your installation, a free telephone help-line service is available.